Thisstory was updated at 11:27 a.m. EDT. As a newmajor motion picture about famed female pilot Amelia Earhart prepares to launchonto movie theater screens this weekend, a scarf she wore is being readied forits own liftoff, flying on the space shuttle with the astronaut grandson of herpersonal photographer. RandyBresnik, whose grandfather Albert was recruited by Earhart in 1932 to be heronly authorized photographer, is set to take the scarf onshuttle Atlantis when it departs with supplies and spare parts for theInternational Space Station (ISS) in November. "Weare flying Amelia Earhart's favorite scarf that she unfortunately did not takewith her on her final mission," revealed the STS-129 astronaut during aninterview with collectSPACE.com. "Fortunately, she also decided not to take her photographer with herotherwise I might not be here today." As the film"Amelia" starring Hilary Swank in the title role recounts, Earhart,who made the firsttransatlantic solo flight by a woman in 1933, and her navigator Fred Noonandisappeared while flying over the Pacific Ocean during an attempt in 1937 tobecome the first female to fly around the world. Earhart'sscarf accompanying Bresnik on STS-129 is on loan from the Museum of WomenPilots in Oklahoma City, which displays the history of the Ninety-Nines, theinternational organization of female aviators founded in 1929 by 99 womenpilots led by Earhart as president. "Ithas the Ninety-Nines' symbol, the intertwined nines in the center of it,"described Carolyn Smith, chairman of the Ninety-Nines' Board of Trustees forthe museum, of the red and white scarf. "Weknow that she wore the scarf," continued Smith. "We don't have anypictures of her wearing that exact scarf but it was given to us either by hermother or her sister when they gave us a number of other items of Amelia's. Sowe know that it was her scarf and she wore it, but we do not know exactlywhen." TheNinety-Nines have at least one other of Earhart's worn scarves and it too hasbeen carried into space. The first American woman to pilot and command thespace shuttle, Eileen Collins, flew that scarf on her first mission in 1995. Yet anotherscarf -- a brown, gold, and orange silk square belonging to Purdue University-- flew on the 1990 mission to deploy the Hubble Space Telescope. 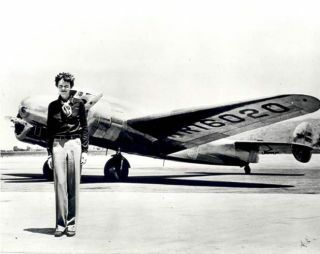 And a watchthat Earhart wore is slated to launch to the space station with astronautShannon Walker in the spring of 2010. So for theNinety-Nines, it is less this time that the scarf is flying to orbit than it iswho is taking it there. "It isinteresting and maybe a little bit completing a story," explained Smith. "Whywe're really interested in Randy taking the scarf up into space is because ofhis unique relationship to Amelia through his grandfather," said Smith. "It's very unique that his grandfather took all of these pictures and thatwe have these pictures, and that the grandson of that photographer is actuallyan astronaut who is going to be taking it up into space. That's where the realunique connection is, Randy taking it up into space." Thatconnection will be doubly represented on Atlantis, as Bresnik is also flyingone of his grandfather's photographs for the Earhart Birthplace Museum inAtchison, Kansas, which is also operated by the Ninety-Nines. Accordingto Smith, once Bresnik returns the scarf, it will be part of a new display atthe Museum of Women Pilots dedicated to his grandfather's photographs. For hispart, Bresnik is also planning to capture a special photo of his own. "Theother thing he told us is that he has the coordinates for Howland Island,"shared Smith, referencing the island that Earhart was trying to find and landat when she disappeared. "He is going to try to take a picture of [theisland] as they overfly it in the space shuttle." "Hesaid, 'If nothing else, some part of Amelia will have finished heraround-the-world trip.' I thought that kind of neat," said Smith. "Wherevershe is, wherever she ended up on that final flight, we'll be within 200 milesof it," said Bresnik. "Her scarf will be that much closer to herduring this flight. That will be pretty neat." Click here to view AmeliaEarhart's scarves and wristwatch that have flown or will fly in space.